A Social Network is the social structure which facilitates communication between a group of actors (individuals or organizations) that are related somehow (i.e. by common interests, shared values, financial exchanges, friendship, dislike, etc). For instance, your friends and you form a social network. But, social networks operate on many more levels, from family relations and disease spreading up to the level of company strategies, social movements or even nations. Furthermore, research in many scientific areas has shown that social networks are important when we study the way problems are solved, diseases are spreaded, organizations are run, and the degree to which individuals succeed in achieving their goals. Social Network Analysis (SNA) is a beautiful blend of Sociology and Mathematics, composed of various interdisciplinary techniques for the study of such social networks. 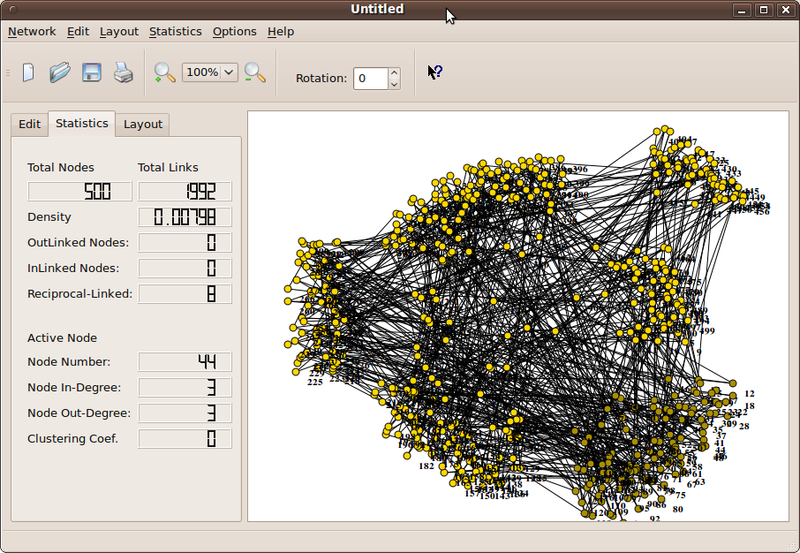 SNA researchers conceptualize social relationships in terms of nodes and edges (links) in mathematical graphs. Nodes represent the individual actors within the networks, while edges visualise the relationships between those actors. The result is graph-based structures which are often very complex. The application can compute basic network properties, such as density, diameter and distances (shortest path lengths), as well as more advanced structural statistics, such as node and network centralities (i.e. closeness, betweeness, graph), clustering coefficient, etc. Various layout algorithms (i.e. Spring-embedder, radial and layered according to node centralization) are supported for meaningful visualizations of your networks. Furthermore, random networks (Erdos-Renyi, Watts-Strogatz, ring lattice, etc) can be created with a few clicks. SocNetV is a work in progress and is being developed in C++ and Qt, an open-source GUI development toolkit from Nokia. Our primary target platform is Linux, but you can compile and run SocNetV on OS X and Windows as well, as long as you have Qt4 libraries installed. First you need to download deb package from here you can install this deb package by double clicking on it. Not bad, but their are much better tools to visualize socials network… try http://www.gephi.org/ for exemple.